The new TV campaign for Velux, the world leading roof window brand, has been aired in the UK. Created by The Union, the campaign will run across Europe. 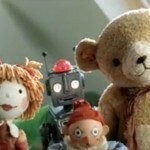 The ad features a set of toys that come to life in a dusty old attic, and provide the inspiration for a loft conversion.